Certain equipment may be needed to recycle foam cost-effectively. A densifier is perhaps the most critical piece of equipment. 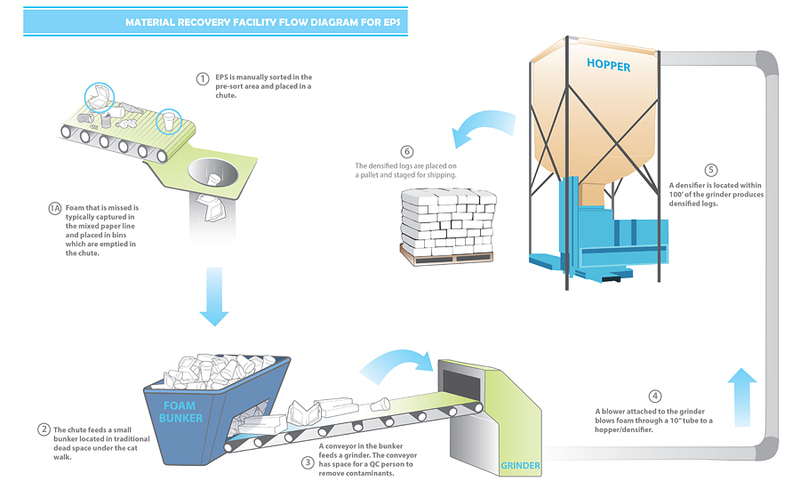 While this is a key component to effective foam recovery, the grant program covers various pieces of equipment to include balers, shredders, conveying equipment, bunkers, hoppers, etc. The information below covers details related to densifiers and is intended to guide you in project planning decisions. Trial options – Depending on your equipment provider, you may have the option for equipment trials prior to purchase depending on your application. If you are unsure about the size, type, and machine performance required for your application, be sure to ask about trial options before making a purchase. FPI wants to make sure the equipment is right-sized for your application and serves you well. FPI densifier overview upon grant award – As a value-add to the grant award process, FPI will provide a densifier overview upon award of an equipment grant. We would love to share our experience and industry expertise to make sure the equipment you have selected is right for you. Choosing the right densifier – When selecting a densifier, keep in mind that municipal recycling streams vary, as do foam types. Foam polystyrene can have different density, thickness and levels of rigidity, all which impact the effectiveness of the equipment. In a MRF environment, a hydraulic densifier may be a better option, since it can handle foam polystyrene with mixed densities, whereas a screw-drive densifier should work well in a location with a more uniform feedstock, like a cafeteria. Weight – If you plan to recover a combination of rigid PS and foam PS in a MRF environment, note that when collected together in standard generation volumes, the combination can create bales in the 800 to 1,100-pound range—heavy enough to make “weight” in truckload quantities. Hydraulic densifiers use hydraulic pressure to compact the foam. With a continuous operation model, the foam is extruded into a dense log. They can effectively process various densities of foam at the same time without melting in the machine. Screw drive densifiers use augers to push foam through a chamber at a specific speed and pressure to densify the foam into a solid log or block. They perform best when the feed stock is limited to one density of foam at a time. Some companies, however, have made advances that allow their screw drive densifiers to also process mixed densities of foam. Hybrid densifiers combine the best features of the screw drive densifier system with those of the hydraulic densifier system, resulting in an efficient way to process recycled foam. Hybrid cold compaction densifiers use augers and hydraulics to compact foam with no melting. Thermal densifiers use heat to melt foam into a taffy-like state. The foam is extruded in the form of a rope and then transferred to containers. Thermal densifiers can effectively process various densities of foam. Please note that inclusion of these vendors does not indicate an endorsement of these companies by FPI and/or the FRC, simply an acknowledgement that they sell densifiers. In addition, this list may not be complete. If you sell polystyrene foam densifiers and would like your company to be listed here, please send your request to recyclefoam@fpi.org. In addition to a densifier, a grinder will be needed, as well as conveying systems and electrical installations, to recycle foam. A list of additional equipment manufacturers may be found in the report “Unlocking the EPS Recovery Potential: Technologies Enabling Efficient Collection and Recovery,” published by the PLASTICS Industry Association (formerly SPI). Click here for a copy of the report. While all MRFs are different, here is a suggested layout when incorporating foam recycling equipment into a MRF.